UPDATE (April 19th): The document now reflects new changes introduced in Wave Engine v. 2.1.0. Default Wave Engine launcher project for iOS assumes that your game will run as a stand-alone view inside your application. However, what if you want to mix native views or navigate between different controllers? Is there a way to join the native world with your scene’s one? The answer is yes. Keep reading this article, and you will learn how to accomplish it. 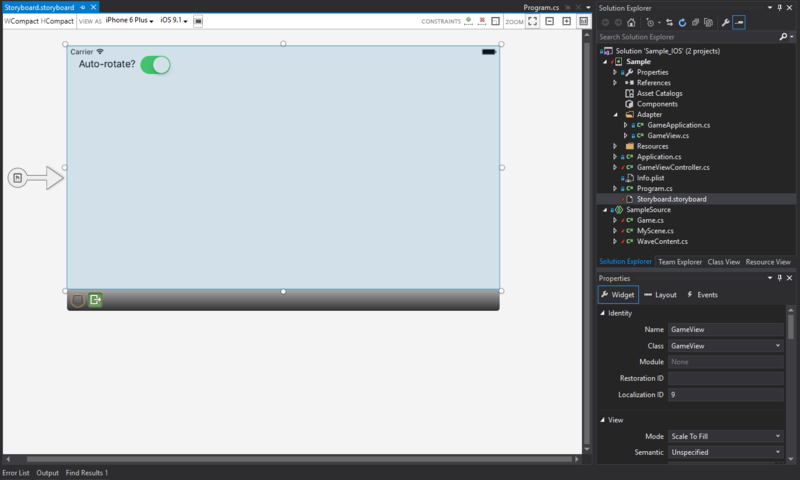 First step is to create a new Wave Engine project using Wave Visual Editor. You can follow My first application which will guide you step by step. Please, remember to include iOS as target platform when creating it (you can later create it as explained here). Open the iOS launcher solution (you’ll find the Solution file inside the project’s root folder), we’ll write some extra code to achieve our goal. You’ll notice there’s an existing Storyboard inside Controllers folder. From this point of view, the app behaves as any other iOS one, containing view controllers within such Storyboard. If you open Main.storyboard, there will be the Main Controller, with a GL View in the end, where Wave Engine is actually rendered. On top of that one, there is another “empty” view (well, it just contains the GL one). This one is where you can drag and drop native controls. So far so good. Wave Engine is, starting from v. 2.1.0 (Hammer Shark; complete list of versions), already integrated into a common iOS project. Please keep reading to discover a small sample, and how the communication can happen between both worlds. The principal objective of our sample solution will be to communicate some native side views with our scene, allowing them to change our game’s entities behavior. Following with above steps, still in the Storyboard, we’ve also added an UISwitch for pausing the game scene, in order to highlight how the communication between native iOS and Wave Engine can be done. Our scene is quite simple: a fixed camera pointing to a cube, which’s endlessly spinning. Such can be entirely set-up within Wave Visual Editor (remember My first application; Load a primitive can be helpful as well). Due to the nature of the demo, pausing the scene is achieved simply by deactivating the Spinner component, child of the cube Entity. This can be done through its IsActive property. In this article we are going to review the conversion process that Wave Engine 2.1 uses to convert our game to other supported platforms. 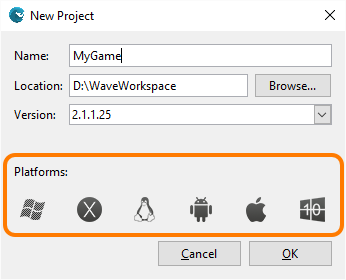 Wave Engine 2.1 has 3 development platforms (Windows, Linux and MacOS) where you can use Wave Visual Editor and 3 mobile target platforms (Android, iOS and Universal Windows Platform), additionally you can deploy your game on development platforms too.